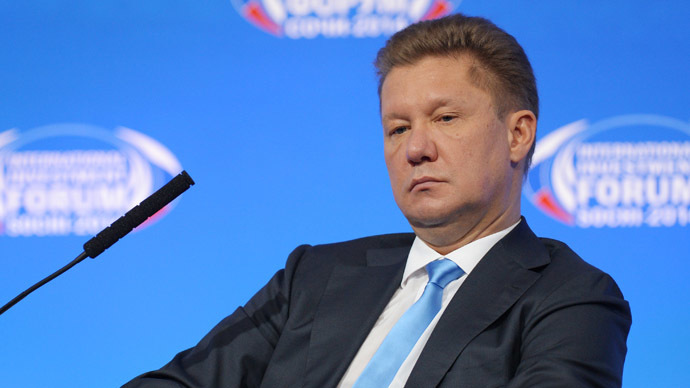 Russian gas monopoly Gazprom has asked the government to consider extending its discount on gas supplied to Ukraine for three more months, said the head of the company Aleksey Miller. “We consider the period of three months is optimal. First, because a spring-summer period is coming and also because we see a high dynamic of change in the gas prices in foreign gas markets,” said Miller in an interview with Rossiya 24 TV Channel. “Such a discount wasprovidedat the end of October last year as a result of negotiations between Ukraine, Russia and the European Commission. The discount was provided for five months and its period will end tomorrow, on March 31,” he said. Miller added that the provision of a gas discount is part of the current gas supply contract signed by Ukraine in 2009, and making this sort of decision is fully within the remit of the Russian government. The ministry head, Aleksandr Novak, later confirmed that the government received the European Commission’s proposal to consider extending a gas price discount for Kiev with regards to customs duty. “The Russian government will work on the decision in the nearest future,” Novak said. In turn, Russia expects the EU to offer financial support to Ukraine so that it can pay for the Russian gas, should such need arise, the energy minister said in an interview with Rossiya 24 channel. “We expect the European Commission’s counteraction,” Novak said, mentioning possible financial support for Kiev. Earlier this month, Novak said that if the discount is approved, it would cover gas supplies for the second quarter of 2015, with further reviews after that period subject to global market price volatility. Ukraine has accused Russia of charging unreasonably high gas prices. Russian Energy Minister Aleksandr Novak said earlier Ukraine will be charged $348 per thousand cubic meters of gas from April 1. In the first quarter of 2015 Ukraine paid $329 per thousand cubic meters for Russian gas.